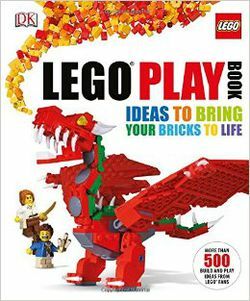 LEGO® Play Book is a book published by Dorling Kindersley released in 2013. According to the front cover of the book, it has "more than 500 build and play ideas from LEGO® fans". It's divided into five sections: Once Upon a Time, A Small World, Go Wild!, Things That Go Bump in the Night, and Wish You Were Here. 3.1 Models and ideas in Go Wild! Once Upon a Time, the first section of the book, is about fairy tale-related model ideas. The models in this section were designed by Barney Main. The second section of the book, A Small World, is about micro-scale model ideas. The models in this section were designed by Tim Goddard. The third section of the book, Go Wild!, is about animal model ideas. The sets were designed by Peter Reid and Yvonne Doyle. Models and ideas in Go Wild! The fourth section of the book, Things That Go Bump in the Night, is about scary model ideas. The sets were designed by Rod Gilles. The fifth section of the book, Wish You Were Here, is about vacation-related model ideas. The sets were designed by Tim Johnson. Facts about "LEGO Play Book"
This page was last edited on 31 August 2016, at 17:03.